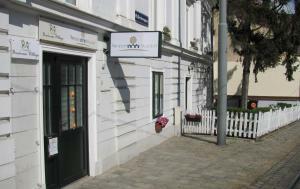 Located in the quiet residential area of Nussdorf, Pension Nussdorf is 30-minutes’ drive away from the centre of Vienna, and the Beethovengang Tram Stop (line D) is in front of the house. Free public parking and free WiFi are available on site. All apartments come with a terrace and a small garden, flat-screen satellite TV and a private bathroom with a shower. A supermarket and restaurants are within a short walking range. There is a lockable bicycle storage room on site. Guests of Nussdorf Pension can enjoy free time at the public outdoor pool Krapfenwaldbad, which is 3 km away.